Voice Box offers an opportunity to focus on the fun aspects of communication. It's a great way to help all pupils to feel included and build children's communication confidence in a friendly and supportive environment. Helping your child to develop their speech, language and communication skills will enable them to unlock their potential, aid their academic achievement, confidently engage in social situations and support their long-term employability in adulthood. 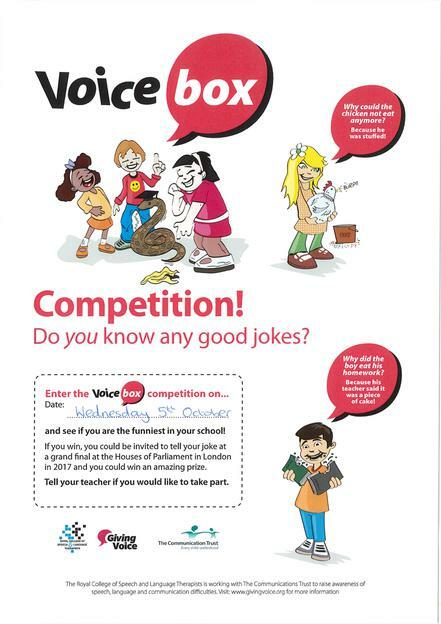 Pupils taking part in Voice Box may even be selected to recite their joke at a Grand Final, held by the Royal College of Speech and Language Therapists and The Communication Trust at Mr. Speaker's House in Westminster, London, next year.